While a two and a half hour drive is a bit far for a day trip—well morning trip, really—the views and conquering two hikes solo were worth it. 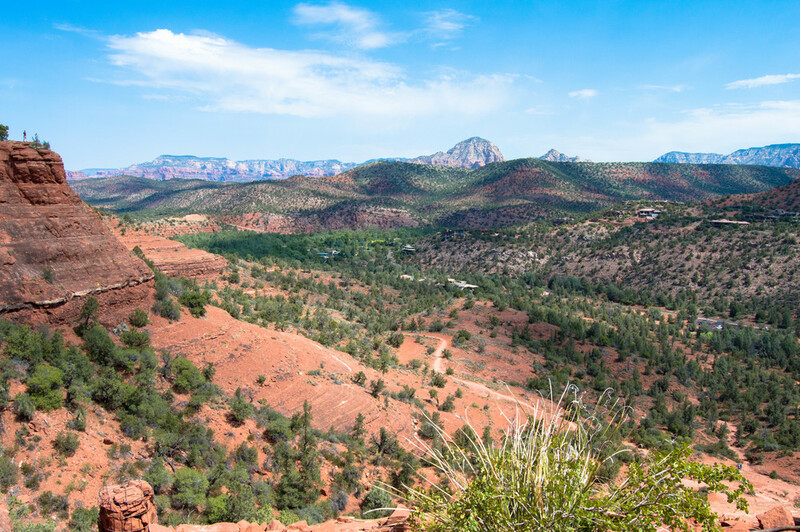 Ever since I moved to Arizona over a year ago, I've wanted to hike in Sedona. In a previous post, I talked about overcoming my fears of hiking new places alone. I figured this week of being unemployed is as good a time as any to put to practice what I preached. I also wanted to play around with my new camera. I would have preferred to stay the night in Sedona and hike a few trails over a couple of days, but my Airbnb fell through and my bank account laughed at my considering a hotel while unemployed—so decided to just do a day trip. I've heard a lot about Devil's Bridge and decided I would definitely hike that. And one of the members of Women on Adventures mentioned Cathedral Rock while we were hiking Fossil Springs. I had my two hikes. All I had to do was research how to get there and make sure I could survive each one. I even printed out maps of the trail areas the night before, just in case my ever fickle phone signal decided to fail and I had no access to GPS. I decided to hike Devil's Bridge first, considering I read that Cathedral Rock is better to do in the afternoon when you can hike in the shade of the rock. I arrived at the Dry Creek Vista parking lot at about 7:00 am (I left at about 4:30 to beat the God awful Phoenix traffic). If you have a high clearance vehicle, you can continue on Dry Creek Road to the Devil's Bridge trailhead—the rest of us have to either walk that or take the Chuck Wagon trail. I read the Chuck Wagon trail was more scenic than walking Dry Creek Road, so I took that. It was a nice and quiet and, after about a mile or so, it brought me to the Devil's Bridge trailhead. From there, it was a much steeper mile of hiking but views like the ones below made the occasional scrambling worth it. The moment I saw Devil's Bridge I understood why it was named so. You arrive on a cliff that's a bit higher than the structure, which makes the bridge itself rather unimposing. Its allure comes not from its impressive build, but from its inviting nature. Like the devil himself, it subtly tempts you with something beautiful and exciting—and throws in an element of risk. The middle of the bridge is wider than it looks from afar, but one wrong step and you'd be taking a tumble off the edge. On the way back, I followed my fellow hikers in taking Dry Creek Road back to the parking lot. This route was less scenic but it was nice chatting with others about what Sedona hikes they've done. One man I talked to told me I needed to visit the Chapel of the Holy Cross—a church built into the rock overlooking Sedona. It was on my way to Cathedral Rock, so I figured why not. I might have been a better Catholic had I grown up going to a church with views like this. I couldn't get over how in tune with the landscape the church was. Made of a reddish stone material, it blended in with the red rock that was its foundation. 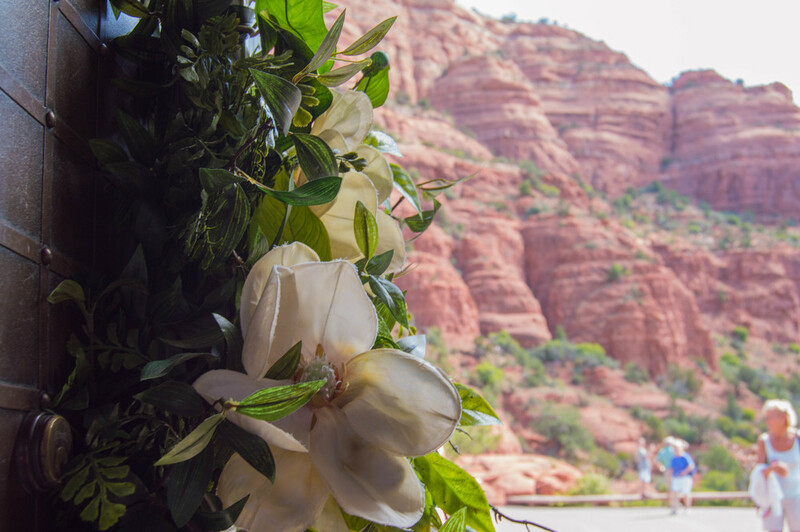 Anywhere you stood in the church you could see Sedona—be it a view of the city it overlooked or the red cliffs towering behind it. Once I had my fill of the chapel, I drove the short distance to the Cathedral Rock trail. You will have to buy a pass ($5 for the day) at one of the self-service machines if you plan to park at the trailhead. 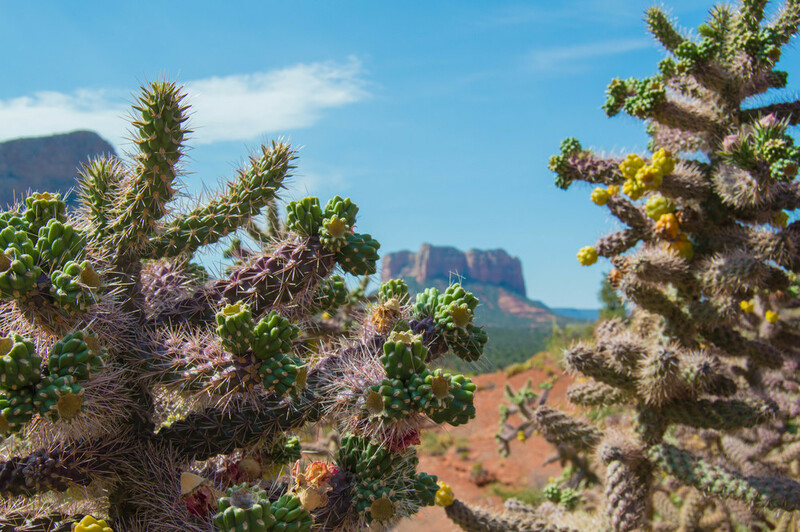 The Cathedral Rock trail is a very short, yet steep trail—gaining over 600 feet in elevation in less than three-fourths of a mile. There was much less vegetation (meaning a lot more sun exposure) here than there was at Devil's Bridge. 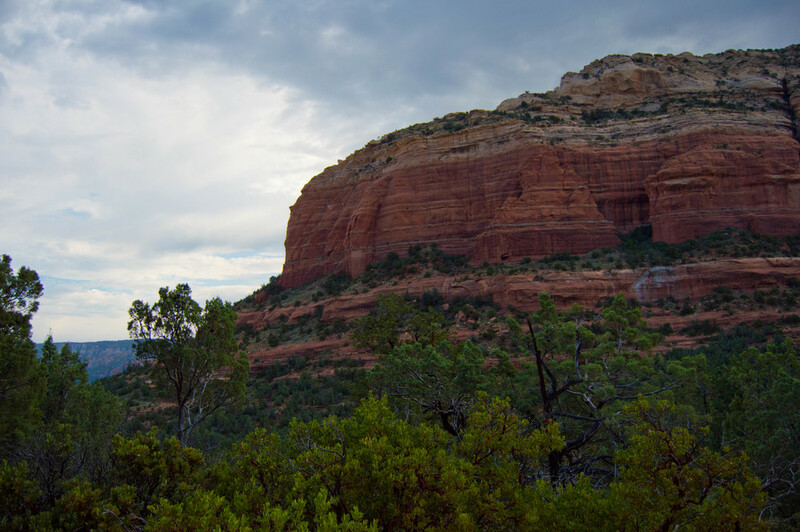 Much of the trail entailed scrambling up variations of Sedona's distinct red rock. This hike was very different from anything I'd previously done, simply because of how much I used my hands to climb up the rock. There were a couple spots with ledges around five feet in height but (thankfully) there were steps carved into the rock—whether deliberately or from traffic over the years, I'm not sure. By the time I got to the top, I was definitely feeling the effects of the heat and hiking two trails in one day. I sat in some shade to have some trail mix before I went exploring about the top of the rock. The end of the trail landed between two of the rock's pillars, framing incredible views on both sides. One hiker told a few of us that we needed to venture to the other side of the south pillar. 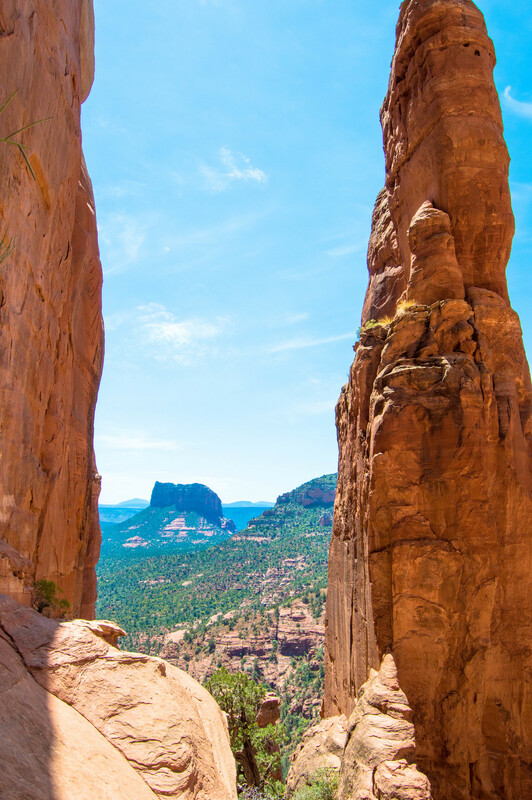 You'll get friendly with the pillar wall getting there, but it's worth it to see another view of Sedona. On my way back down, I ran into one family that asked if I made it to the creek. Apparently, the Templeton trail—which crosses the Cathedral Rock trail—leads to a creek two miles from where the two trails cross. As tempted as I was by taking a dip in the creek, I was exhausted, almost out of water, and really looking forward to my car's air conditioning. By the time I got back to my car, it was only about 11:00 am. Normally, I hate spending less time on a trip than it takes me to drive there and back; I just never find it worth it. But I felt so accomplished crossing two hikes off my ever growing bucket list that I was okay with it. So I headed back to Phoenix, adding this Templeton trail creek to my list.